I can’t believe July is nearly here! This summer is brutal so far with high temps and little or no rain. I REALLY hope we get some rain sooner rather than later. Enjoy some funny farm pet pics! I could start a series consisting entirely of Betty’s funny sleeping positions. 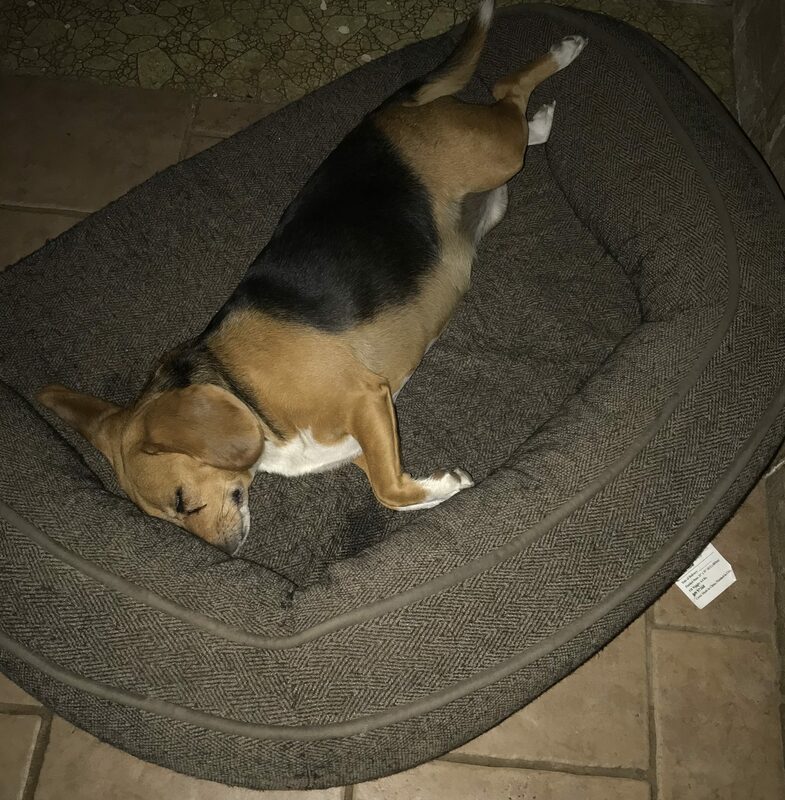 This is the most relaxed Beagle in the world! We just love her! If you’d like to adopt Betty click here. 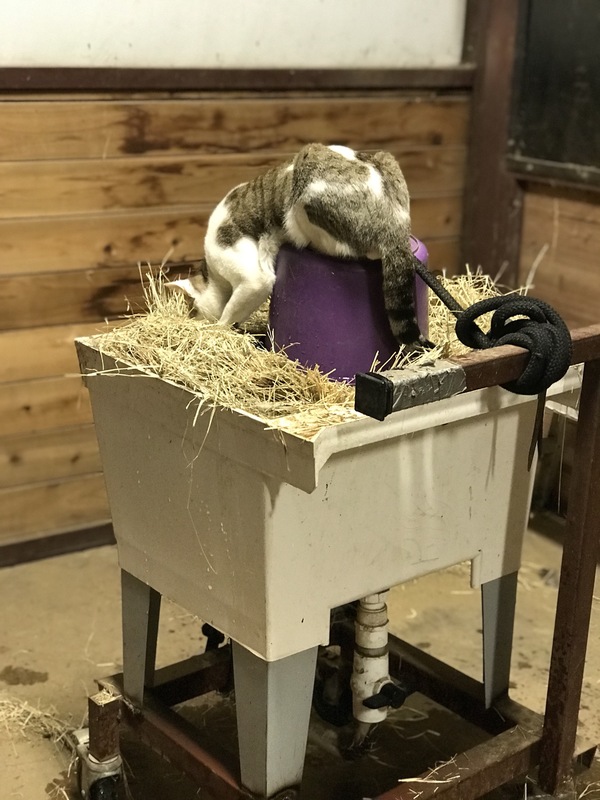 Murtagh always waits for me to fill the hay soaker, then he jumps on the bucket or the dry part of the hay to drink the hay water. He’s a weird kitty! Hot summer days make for a thirsty kitty. 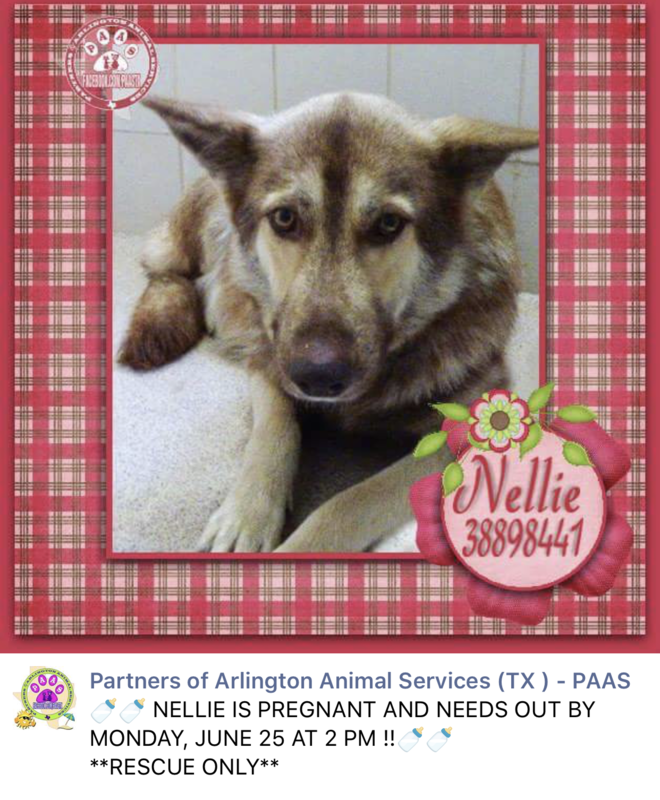 If you follow my social media you’ve seen posts of our new foster dog, Nellie. She is about to pop with puppies! 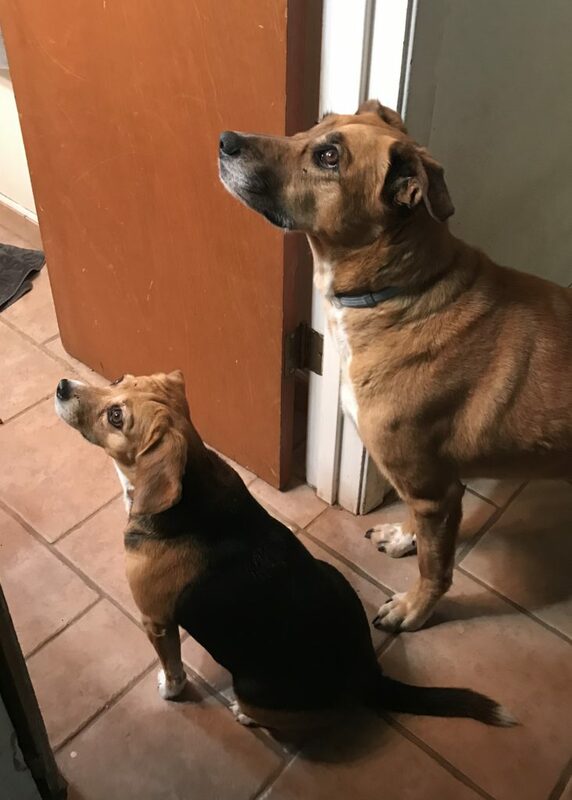 She visited the vet on Tuesday and they estimated she would deliver in 24 to 48 hours. We are now on day 4……… I suspect they will arrive this weekend. We appreciate prayers for an easy and safe delivery of healthy puppies! These two are obsessed with Edith, our cockatiel. I think their faces are so cute how intently they are staring at Edith. Happy weekend! Coco is going to yet another little horse show this weekend. Hopefully she behaves better! What are you getting up to this weekend? What a week! Lots of emotions and stress! Sterling seems to be improving, thankfully. Coco is having some issues that appear to be related to either ulcers or ovaries. Hopefully we will know more when the vet comes (again) next week. On a happier note here are some fun photos from the farm this week. This photo is terrible and ridiculous, but SO funny. 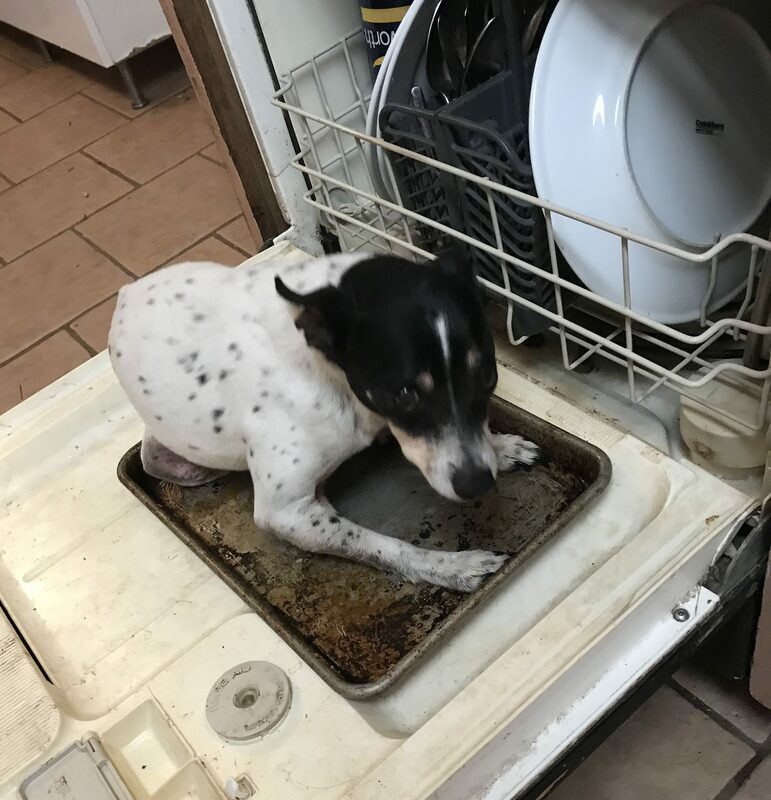 Boot City put the baking sheet on the open dishwasher door and Chivas CAMPED out and licked that thing for at least 30 minutes. She growled and snarled at any dog that got close to her! She’s pretty funny in her old age! Meet Maggie, our newest foster dog! 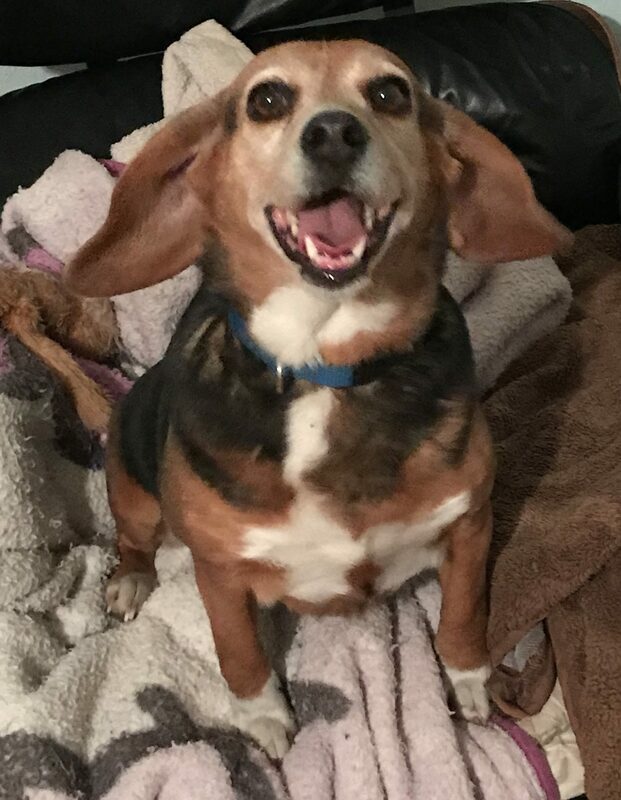 Maggie is from the Fort Worth shelter and is a 4yo Beagle. She has heartworms and is pleasantly plump so will be undergoing treatment and a diet. She will be available to adopt in about 60 days! 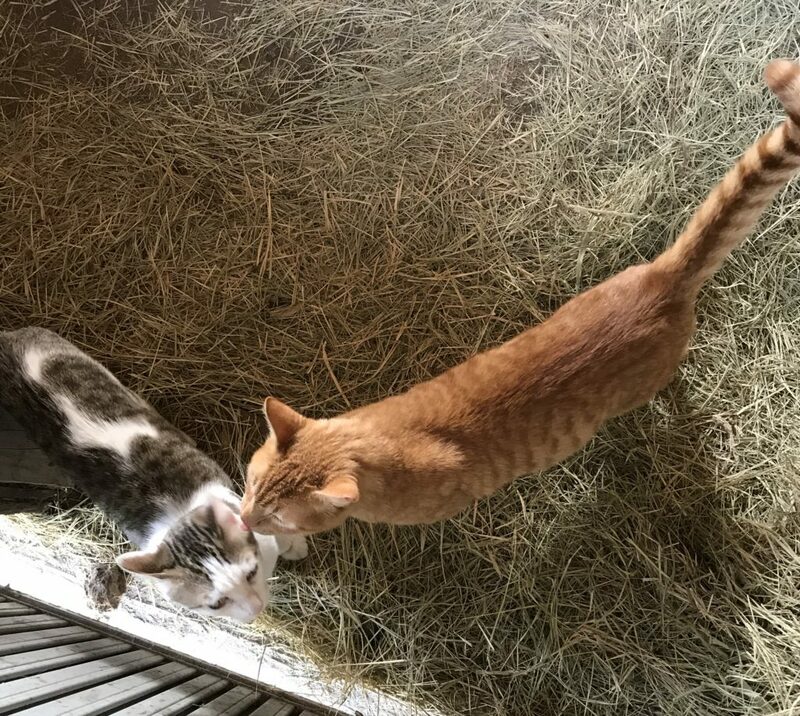 Murtagh lives in my tack room, but gets be out when we are at home (we worry about him getting eaten by predators with all that white fur) and boy does he LOVE his barn cat besties! 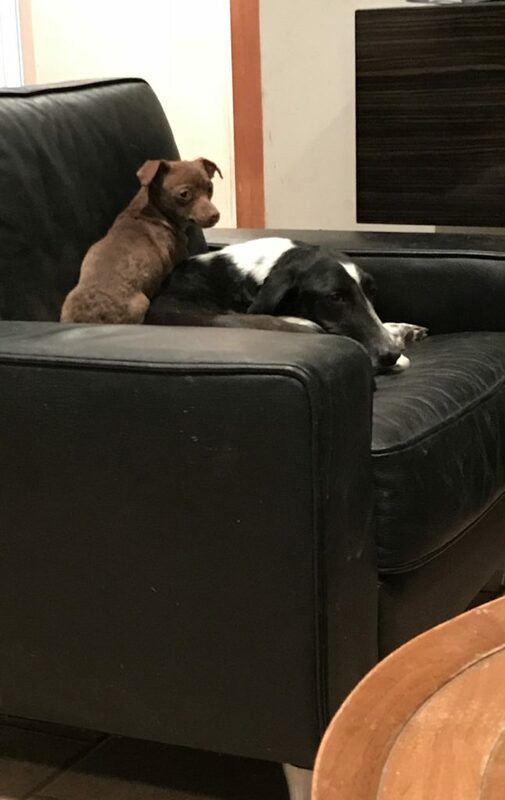 Lily, our foster chihuahua, was adopted last Sunday (YAY) so Patches likes to bother Annie now. Annie growls at her a lot, but it doesn’t dissuade Patches from laying on her and trying to lick Annie’s ears. I’ll be spending my weekend cold hosing, sweating and cleaning Sterling’s leg and hopefully riding Simon since he’s the only rideable horse I have right now! How about you?